Fun festive 25mm pin badge. 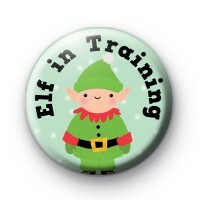 This super cute badge has Santa's little Elf & the text Elf in Training around the top edge. It is a sweet badge to give to kids or use as keepsakes for fun Xmas parties.